The Minnesota Senate is on the verge of approving a change to long-public birth record information. A provision in the HHS omnibus bill would change address information on birth records to a “private” data status, from its currently “public” status under Minnesota law. While the bill contains an exception for medical research, it would close off data to historical researchers, genealogists, and most other citizen requesters. MNCOGI and the Minnesota Pro chapter of the Society for Professional Journalists recently co-signed a statement in opposition to this change – found below – and at the SPJ web site. The Minnesota Pro chapter of the Society of Professional Journalists and the Minnesota Coalition on Government Information (MNCOGI) oppose a provision of the Senate HHS Omnibus bill relating to the classification of birth record data. In particular, we oppose language (found in lines 217.24, 244.5-244.20, and 244.14) that would deprive the public of access to long-standing public information regarding birth records. For decades, such information has been useful to a wide range of Minnesotans for historical research, genealogy, and other lawful purposes. By authorizing the release of birth record data only to limited sub-sets of individuals, such as “persons performing medical research,” these provisions of the omnibus bill advance the notion that data should be selectively released to the public based on the type of individual who requests it. This is at odds with the history of the Minnesota Data Practices Act, which does not discriminate between data requesters once government data has been classified as “public.” Such limitations could set a negative precedent for the subsequent classification of a wide variety of data in Minnesota. We urge the committee to reject proposed changes that would constrain public access to long-standing public information. 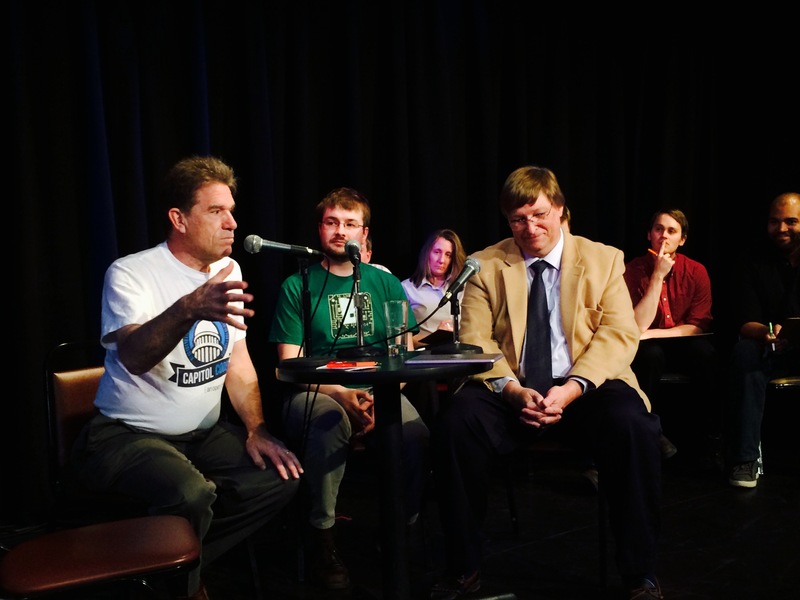 Open Twin Cities co-founder and MNCOGI board member Bill Bushey braved the stage at Bryant Lake Bowl on Monday to sing the praises of open data, along with the Minnesota Secretary of State and Minneapolis’s chief information officer. It was all part of the Theater of Public Policy, an improv group that combines comedy with free-wheeling discussions of serious stuff. The house was packed to hear about the availability of large data sets, privacy breaches and other typically dry matter made more fluid by the wide beer selection and live music. Also spotted in the audience: MNCOGI board member Helen Burke. I blogged last month about how the Star Tribune had waited seven months for the city of Minneapolis to hand over records of an internal investigation into a public official. The documents finally arrived last week, and staff writer Eric Roper had a story about it in Sunday’s paper. He also offered readers the entire investigative file, so you can piece together your own story, in between eight months’ worth of redactions. I confess that I am late to the party when it comes to the growing movement of civic-minded hackers who are doing wonders with government data. But the more I find out, the more I realize that those of us who have wrangled with government agencies for years over public records now have a new generation of compatriots who recognize the power of public data to make the world better. One of those advocates, Bill Bushey of Open Twin Cities, paid a visit to the MNCOGI board earlier this week. 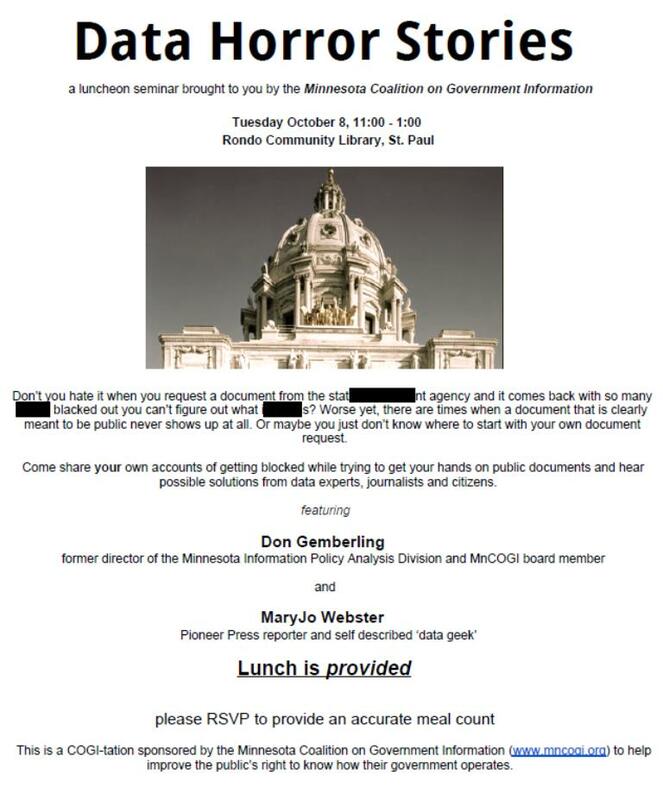 One thing he talked about was the open data questionnaire that was sent to all political candidates in Minneapolis and St. Paul. Several of those who responded were elected to office, and now the public has a record of what they said they would do to make government data more accessible. My Star Tribune colleague Eric Roper blogged about it here. Now let’s they make sure they keep their promises. Star Tribune Whistleblower columnist Alejandra Matos blogs about how once-public records at the Minnesota Department of Agriculture are now unavailable, because of a continuing investigation into a business linked to a salmonella illness outbreak. Here’s the story.